Tonight, we are here to celebrate the Spring Festival, or Chun Jie in Chinese. It is the most important traditional festival in China, just as Christmas in the West. In China, families gather together for Chun Jie. We do couplets and firecrackers, have big dinner and dumplings to celebrate the good time. Chun Jie is the beginning of a year in Chinese lunar calendar. According to the Chinese Zodiac, each year is associated with an animal. 2016 is the year of monkey. Chinese people think that monkeys are intelligent, smart, brave and energetic. Thus, 2016 will be a year full of vitality and progress. I wish all the friends here a successful year of monkey! Today's reception is the very first Chun Jie celebration our Embassy has ever held outside Washington D.C. We hope a closer tie with local communities will foster more exchanges and cooperation between China and the U.S. at the sub-national level, and therefore further promote China-US relations. You may wonder, why start in Charlotte, North Carolina? The foremost reason is the hospitality, honesty, frankness and diligence of the people of North Carolina, and of course, the spirit of Tar Heels. Chinese culture also values these virtues. Plus, North Carolina is a good place for people to pursue education, do business and enjoy vacations. It is home to renowned Research Triangle Park, University of North Carolina and Duke University; Charlotte is the second largest financial center and an ideal city for business in the U.S.. The beautiful scenery of the Great Smoke Mountain and the Blue Ridge Parkway makes North Carolina a nice getaway destination. North Carolina has strong ties with China. The trade volume between China and North Carolina in 2014 has exceeded 15 billion US dollars. That makes China your 3rd largest export market and the largest source of import. Over a dozen well-known Chinese companies have invested here. There are 8 pairs of sister cities or states between China and North Carolina. 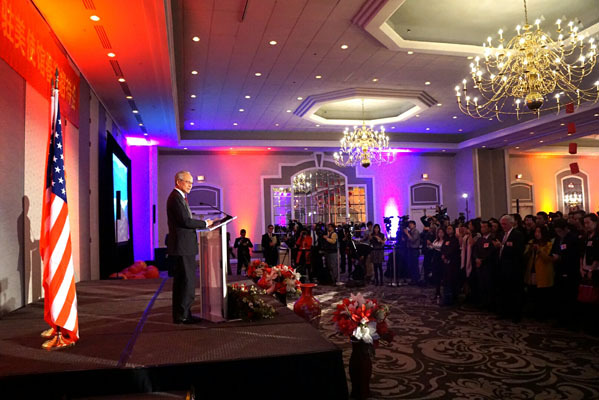 With these compelling numbers and the commitment from all of you, China's cooperation with North Carolina has become an excellent example of China-US sub-national exchanges. Sub-national exchange is a cornerstone of China-US relationship. It means practical cooperation between cities and states, but beyond that, it is an indispensable part of the big picture -- how the two biggest nations in the world work together. Today's China-US relationship owes a great deal to the day-to-day friendly exchanges between cities and states of our two countries. Built on past achievements, I believe the future will be even brighter for China-US sub-national exchanges. My confidence comes from the following three reasons. First, China-US relationship is strong, stable and mature. Last September President Xi Jinping paid a successful state visit to the U.S.. The historic visit achieved 49 outcomes and reaffirmed the commitment from both sides to building a new model of major-country relationship between China and the U.S., which features non-conflict, non-confrontation, mutual respect and win-win cooperation. We have differences between us. It is only natural for our two countries with so much interaction. What we should do is to make sure that these differences do not dominate bilateral relationship. We should always keep in mind that our common interest far outweighs our differences and is still growing. Second, trade and people-to-people bond adds to the good prospects of the overall China-US relations. Against the sluggish recovery of the world economy, bilateral trade between China and the U.S. keeps increasing. China is now the largest trading partner, and the third largest export market of the U.S.. Meanwhile, China's investment in the U.S. is growing rapidly. It has outpaced annul U.S. investment in China. More and more Chinese enterprises, like Lenovo, China Tobacco and Sun Fiber, have opened operations in the U.S..
We see very encouraging progress made in people-to-people exchanges. The reciprocal arrangement of 10-year multiple-entry visa has started a new era for ordinary people traveling between our two countries. 2016 is China-US Tourism Year. It will give a strong push to people's interactions and mutual understanding, and I expect more Chinese tourists coming to North Carolina. This afternoon I visited Waddell Language Academy and I had a wonderful time with the students learning Chinese there. I am impressed by their strong interest and wonderful achievement. I am confident that the young generation will be capable to foster even stronger ties between our peoples. This is where the real strength of our relationship lies. Third, China's strong growth momentum powers economic engagement between our two countries. Last year China had a growth rate of 6.9%. This is surely one of the best scorecard in the world. This growth rate for China means 500 billion US Dollars new GDP was created, making more than 25% contribution to the world economic growth. Moreover, we value the quality of growth than just numbers. The new five-year plan for China's economic and social development aims to bring innovative, coordinated, green, open and inclusive growth. That will transform Chinese economy from investment and export driven to promoting service sector and domestic consumption, environment friendliness, and greater openness to the rest of the world. This new orientation and effort will easily dovetail with the economic development at the local level in the U.S.. North Carolina leads in its biotech and green industries. Your cooperation with China enjoys great potential yet to be tapped. In a word, this big picture shows great prospects for China-US sub-national cooperation. We will make it a priority in the overall bilateral relations in the year 2016. I always encourage my team to visit different states and feel the true America outside Washington DC. I think I am right, especially this year, when rhetoric becomes a main business inside the Beltway, we are more than obliged to step out, and to do real business at local level, like here in Charlotte, North Carolina. The year of monkey is coming. Maybe you have heard about the most famous monkey in China, the Monkey King. Like the fellowship in The Lord of the Rings, Monkey King and his pals marched a long and tortuous journey and with courage, hard efforts and perseverance, successfully retrieved Buddhist Sutras from India. For China, the U.S. and the whole world, there are numerous challenges in front of us. But, with the collaboration between our two countries, at national and sub-national level, with such spirit like Monkey King and Tar Heels, we will certainly overcome those difficulties, and realize our goals.